The JRPG is coming to Steam June 7, according to a deleted blog post. 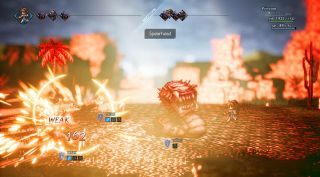 Octopath Traveler, the multiple-story JRPG that launched exclusively on the Nintendo Switch last July, is apparently coming to Steam. That’s according to a blog posted and then quickly deleted by Square Enix. According to the deleted post, Octopath Traveler is set to launch on PC June 7. Since late last week, rumors about a possible PC port kicked off when Korea’s Game Rating and Administration Committee briefly appeared on the organization’s website. The post, which you can read in full over at Gematsu, points out the the PC release will mark the first time non-Nintendo owners will be able to play Octopath Traveler, and lists the eight main characters whose stories you follow throughout the game. It wraps up by encouraging players to add the game to their Steam wishlists. I've reached out to Square Enix for comment. Regardless, this is great news—Octopath Traveler marries an excellent set of stories presented in lovely throwback pixel art inspired by SNES-era JPRGs, mixing 2D and 3D imagery. While we wait for a more official announcement—or at least, a less accidental one—here's the original launch trailer.